You may have noticed that I haven't been updating as often as I used to. I've been struggling to find a schedule for the blog while juggling Glitter Guide, wedding planning, and everyday life. With my fiancé's insane schedule he's no longer available to take outfit pictures (to be honest, I haven't had the time either). This week we're spending time in Southern California for my fiancé's CrossFit competition. When we get back we'll be in major wedding countdown mode and then off on our honeymoon! With all the work that I'm pouring into Glitter Guide to prepare for my time off, I won't have as much time to update Sterling Style. I'll still blog when I can, but for the first time in a few years, I may have to step away from the blog. I hope to get back on a schedule when I get back from the honeymoon. Thank you for always being so supportive! It means so much to me. You deserve a little time off. Enjoy your wedding and honeymoon!! I'm sure it will be perfectly romantic and amazing. awww...i don't know how you do it all! enjoy your time away...we will be here when you get back! You deserve this time, enjoy it! Right before my wedding last year I was working 60-70 hrs overtime, planning a wedding and had house guest= awful. Take all the time you need, Taylor, I`m sure everyone (at least I do) love Glitter Guide and appreciate all the effort and work that you put into it. Now it is time that you support your fiancé (I`m crossing my fingers for him, too!) for his competition and enjoy the last days before the wedding. I also hope the wedding will be as beautiful as you imagine it and that you have a blast during your honeymoon! 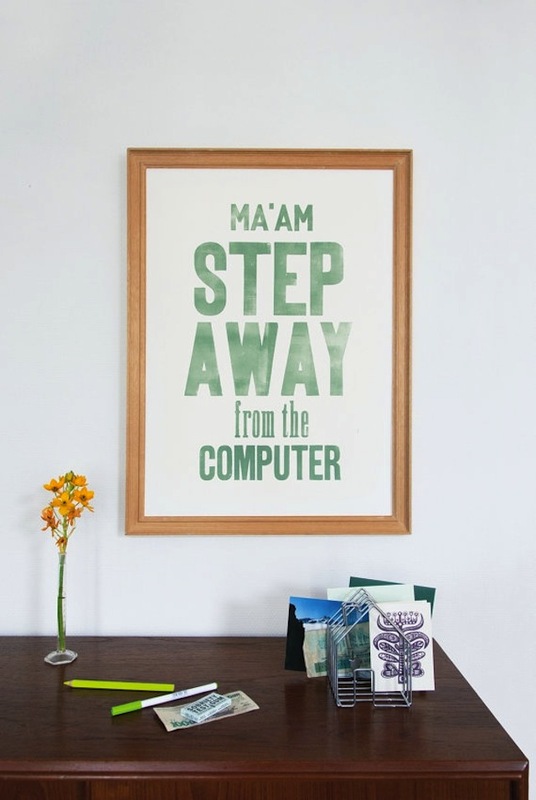 haha I need this framed in my office as a reminder to step away from my computer and join the real world! No worries! It's tough to balance everything. If you're posts are less frequent it just means we will appreciate them more when new ones go up! Best of luck to your fiancé in his competition! Take a break!! You'll be so refreshed when you return. that's a great image, and a good plan. It's good to step back sometimes! You will be missed, but you definitely deserve the time off. Enjoy your wedding and honeymoon! Good luck to your fiance in the games this weekend! I will be watching the online streaming at my box and cheering for him! You should definitely take all of the time that you need. Enjoy the time with your fiancé and his competition. And then focus on your wedding....we'll be here when you get back! Hope you get lots of personal time and enjoy the last few days of your engagement! Take care and best wishes! I can't wait to see photos from the wedding! I so need that print. It's so good to do this once in awhile... You need to focus on real life too! Enjoy this unique moment ! We, your followers , will be waiting patiently ! I wanted to say thanks to you for this great read!! Thanks a lot for sharing your wedding and honeymoon with me.Love this post! I enjoy it very much! Good luck to you! All the best! Wow. These photos are absolutely brilliant and your trip seems to be incredible. I am very jealous and I hope you keep these marvelous photos coming! this photos make me really want to go there. so beautiful. You always have such lovely photos.So simple, but so amazing! Very unique! I like it! I have just discovered your amazing blog!You have great taste & a golden eye.